In the small town of Bath, Illinois, a little more than 200 miles southwest of Chicago, an annual competition to catch flying fish draws visitors from near and far. 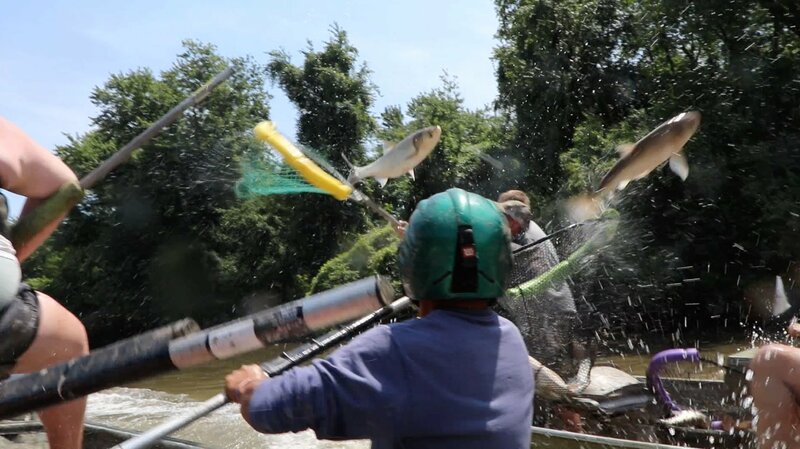 It’s called the Redneck Fishing Tournament, and its primary target is Silver carp, a type of Asian carp that jumps into the air when started by the noise and pressure waves created by boat motors. It’s not uncommon for brave participants to leave the event bloody and bruised from flying fish. The invasive species is traveling up the Mississippi River watershed and its tributaries, like the Illinois River, threatening the freshwater ecosystem of Lake Michigan by outcompeting native fish for food. Fish biologist Jan Hoover from the U.S. Army Engineer Research and Development Center was at the event studying specimen by collecting bone samples to age the fish and examining ovaries to learn more about their reproductive cycles. Monetary prizes and trophies are awarded to participants based on the most fish caught, as well as best costumes. Organizers say proceeds from the event benefit homeless veterans in central Illinois.